There are several special events held throughout the year at Disney World. Epcot's Flower and Garden Festival is 1 of those. In this guide, we've got details on when it's held, what takes place, how we suggest touring, and thoughts on whether or not it's worth it. What exactly takes place during the festival? 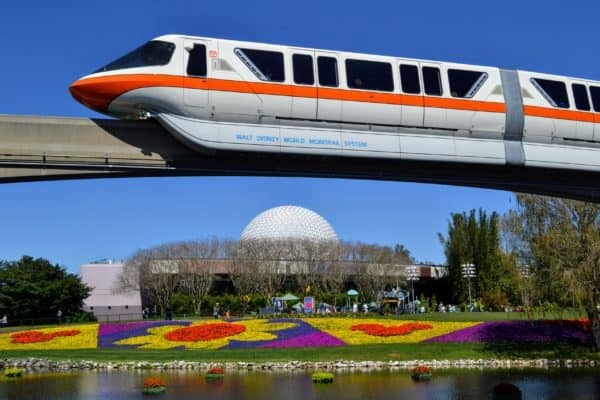 Is Epcot's Flower and Garden Festival worth it? The Flower and Garden Festival is an event held at Epcot every spring that focuses on special exhibits related to gardening (hence the name). During the festival, nearly all of Epcot is decked out with gorgeous flowers and vegetation and all things garden. If you find yourself visiting Epcot while the festival is taking place, you're in luck, because, in our opinion, the park is at its most beautiful then. In addition to the beautiful flowers and topiaries, there are other activities that occur including unique food offerings and musical acts. All details about those are below. There's no special ticket required to attend the Flower and Garden Festival. Your park ticket to get into Epcot will allow you to enjoy all of the Flower and Garden Festival events (except for a couple of tours - more info on that below). The Flower and Garden Festival typically takes place from the first part of March through the end of May or early June. In 2019, the Flower and Garden Festival dates are March 6 - June 3. That's nearly 60 days to take in all of the gorgeous displays. There are several different things that take place at Epcot during the Flower and Garden Festival, most of which are free. One of the best parts is that the whole park has lots of topiaries (over 100!) that have been created in the shapes of Disney characters. Every year Disney changes up the displays just a bit and typically adds at least a couple new ones to the mix. For 2019, Disney debuted a new topiary featuring Bo Peep and her sheep. New for 2019, the once weekend-only concerts will now be held daily during the Flower and Garden Festival. General seating for the concerts is free and is included in your price of admission to the park; however, if you want a more up-close view of the show you can purchase a Dining Package that will get you a seat in the first 3 rows (more on that below). These concerts are fun and feature groups whose popularity peaked a couple of decades ago, but who still sound great. You can catch the concerts every day during the festival at 5:30 p.m., 6:45 p.m., and 8:00 p.m.
March 6-8: Steve Augeri* - "Don't Stop Believin'"
March 11-12: Jon Anderson - "Owner of a Lonely Heart"
March 13-14: Tony Orlando - "Tie a Yellow Ribbon 'round the Ole Oak Tree"
March 15-16: Wang Chung* - "Everybody Have Fun Tonight"
March 21-22: Ambrosia - "How Much I Feel"
March 23-24: Magic Giant - "Set on Fire"
April 8-9: Dennis DeYoung - "Come Sail Away"
April 10-11: John Michael Montgomery - "I Can Love You Like That"
April 14-16: Night Ranger - "Sister Christian"
May 10-11: Marshall Tucker Band* - "Can't You See"
May 12-13: Peabo Bryson "Beauty and the Beast"
May 22-23: War - "Low Rider"
March 24-27: The Guess Who - "These Eyes"
It usually isn't too hard to snag a seat to one of the concerts; however, you'll want to arrive about 30 minutes before the show, or, if you prefer, you can avoid the line (and wait) altogether and book one of the Garden Rocks Dining Packages. Each dinner package includes 1 guaranteed seat to the Garden Rocks concert on that night and a meal that includes an appetizer, entree, and dessert, or if a buffet, it will include 1 full buffet. If you line up early for the dining package, you'll be allowed to enter a bit earlier than the standby line and can choose where to sit (on an aisle in the center usually gives the best view). There's also reserved seating for this package which is the first 3 rows of the theater, and unless you want the front-center seat, you can show up much closer to show time (even up to just a few minutes before the show starts) and still snag a good spot. The available restaurants and prices for 2019 are below. On the Disney Dining Plan? The package can be booked with the Dining Plan at a cost of 2 credits/person. Due to the popularity of the Food and Wine Festival, Disney started offering food and beverage options in special kiosks throughout the World Showcase at all of its festivals. For 2019, there are four new outdoor kitchens: Arbor, The Citrus Blossom, Trowel & Trellis, and Flavor Full Kitchen! In addition to the new outdoor kitchens, several culinary dishes are new to the festival this year as well. Though there are several fantastic food and drink options available, there are a handful of super popular items you might want to find and try for yourself. Verrrrry popular since it's served in an Orange Bird sipper, so be prepare to line up early or get in line. Limit of 10 per person. Though it's not listed in the festival passport, the cotton candy in China is worth checking out. In the same building as the Lotus House outdoor kitchen, you'll find these intricate cotton candy designs which are as pretty as they are fun to eat. You can find all of the menus and see food photos on Disney Food Blog's Flower and Garden info page. Keep in mind that many items can be purchased with Disney Dining Plan snack credits. You can see which items are covered by looking for the DDP icon on the menus. Every year Disney installs several large gardens, play areas, and exhibits. A 9-foot-tall sculpture created out of recycled marine debris in honor of the new Disneynature's feature film "Penguins"
There are typically a couple of tours that are only offered during the Flower and Garden Festival. Epcot Gardens of the World Tour - a 3 hour tour led by a Disney horticulturist. These are offered on Mondays, Tuesdays, Thursdays and Fridays, from 9:00 AM to noon and cost $85.00, plus tax. You have to be 16-years-old or older to attend. 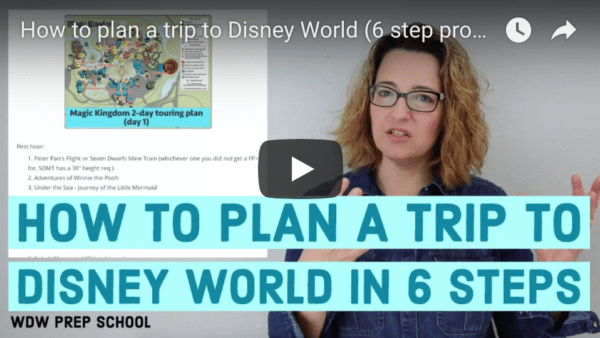 You can book it by calling (407) WDW-TOUR. English Tea Garden Presented by Twinings of London Tea - this a free tour that lasts 20 minutes and takes place in the United Kingdom pavilion. Guests should register by signing up in The Tea Caddy in the UK pavilion. Royal Tea Garden Tour - this 45 minute tour has guests exploring an elegant tea garden to learn all about the artistry and history behind growing and blending tea. The cost is $20.00 per person and can be booked by calling (407) WDW-TOUR. Throughout the park you'll find PhotoPass photographers available to take your picture with some of the topiaries. There are typically a couple stationed at the front of the park, on the main walkway in Showcase Plaza between Future World and the World Showcase, in France, and on the bridge heading over to France from the United Kingdom. Most of the photographers are able to take both regular pictures in addition to cute festival-themed Magic Shots, so be sure to ask for those if you stop for a photo. Fun (and CUTE!) Flower and Garden Festival merchandise can be found throughout the park. You'll find kiosks and booths located all around the World Showcase Lagoon. For 2019 there are 5 different "themes" for merchandise: Minnie's Garden Party, Mickey's Garden Shed, Violet Lemonade Collection, Figment's Imagination Goes Wild, and Spike and Donald. If you want to see all of the collections in one spot (instead of browsing several different booths), you can do that over in the Festival Center which is located in the Odyssey Center. The regular Epcot map includes Flower and Garden info during the Festival. You can pick up the map at the park. Disney has begun issuing these cute little passports for festivals. Inside the Flower and Garden Festival passport you'll find info on every topiary, food kiosk, concert, etc. You can download a PDF version of the passport and/or get one for free at Epcot. 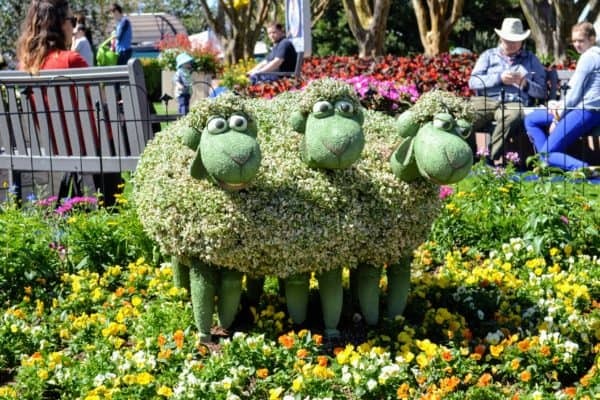 The Flower and Garden Festival (like the other festivals offered at Epcot) is popular with the locals, so avoid the weekends for the lowest crowds. Also, opening day of anything (including festivals like this one) are extremely popular so be prepared for that if you plan to visit during that time. Here are our suggestions for how to put your day at Epcot's Flower and Garden Festival together. There are really only 1 main scheduled thing to plan around: the Garden Rocks concerts. Taking general advice for touring Epcot and adapting them for the Flower and Garden Festival, this is what we'd suggest. 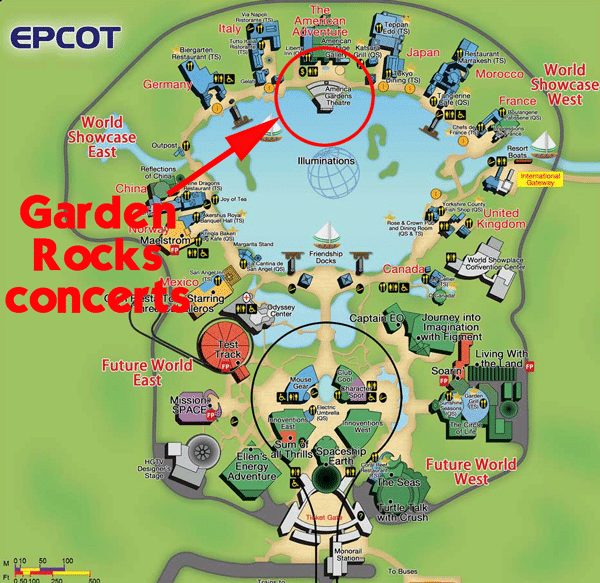 Garden Rocks concert at 5:30 p.m., 6:45 p.m. or 8 p.m. Though the musical acts skew toward middle-aged and older visitors, anybody can enjoy this event. If you plan on being at Epcot during the festival dates, definitely take some time to enjoy Epcot looking its most beautiful. So, will you be attending the Flower and Garden Festival? Or do you have questions that weren't covered here? I planned out our days for our May 2019 trip and realized I planned an Epcot day on a Saturday. We will have our two boys, 4 and 1, with us and I am concerned that the weekends during F&G will be as “rowdy” as the weekends during F&W. Should young families avoid this event on the weekends? How late do the outdoor kitchens serve food ? Are there places to sit at the outdoor kitchens? Trying to decide if we’d like to “hop” the outdoor kitchens or should schedule a reservation as to have a guaranteed seat. Thanks! Can you still trade in a QS credit for 3 snacks at a kiosk? We went to Epcot yesterday. The topiaries were very pretty! Even my 7 year old son stopped to look at them. it was his favorite park. Going March 2018 and this will be my first time at F&G. Do I need to download and print the passport or are they available at the park? We will be going on a Wednesday not over the weekend. And, I assume the passport will be updated (currently showing 2017) when you have that info? You can get a passport there and it’ll be updated to 2018 when it’s available.